I have a Diesel engine, heck I have two diesels. Diesels require lots of power to start because the fuel needs to be heated to combust. 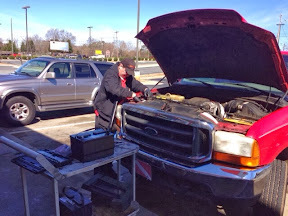 Some diesels do it with compression heat like a Cummins, and others use glow plugs like Ford Powerstroke. I have Ford and therefore glow plugs, so I chew through two batteries every few years. A few years ago I discovered that Autozone has 5 year batteries, with 3 year full replacement. So, after two years I got new batteries. Now it has been four years and I got two new batteries at half price and reset the clock. My next batteries will be free in two years. is your diesel truck one of those diesel trucks that when you are beside one of them at a stoplight and your window is down, the clattering of the motor is so loud that you don't want to go to the beach any more, you just want to commit suicide? Phfrankie, I don't think he'd admit it if he did! I have four glow plugs on my Westerbeast and there is NO loud clattering from my diesel. A soft, secure feeling rumble with a natural purr and a hint of manly power! The newest diesel is quiet. Louder than a gasoline but very quiet for a diesel. My truck is louder but still stock with no modifications that increase noise. What you are hearing is a diesel that has been "chipped". A non standard computer chip has been installed and additional breathers and exhaust installed which boost performance, torque, and power. The more air you add, the faster you get it out makes more power. The chip governs the fuel burning process. This is what you are hearing.